The Vancouver-based trio, Counterfold, consists of an unconventional amalgamation of instruments: a seven string classical guitar, a cajón (a Peruvian percussion instrument), and analog synths. The result is, well an unconventional release of seemingly conflicting ideas that manages to far exceed the sum its parts. 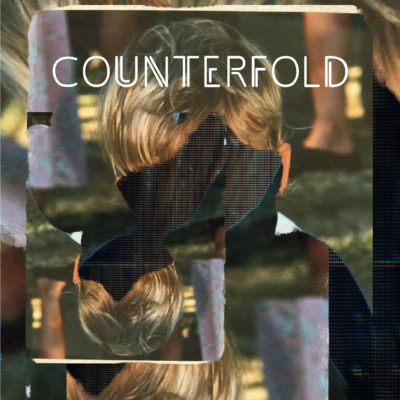 House, the first track on I by Counterfold opens evoking a sense of unease through the use of ethereal synthesizers and stuttering rhythm before the hauntingly contrasting strumming of a classical guitar inharmoniously makes its way into the track. The track progresses steadily, picking up in fervour; the guitar subtly transforms into melodic noodling— remaining at odds with the rhythm section. The vocals come in sounding pained and distant, cementing the themes of separation and isolation the song emanates. This same feeling of paranoia seamlessly segues into synth jabs eliciting panic while the percussion mirroring that anxiety begins to go double time and rises to an uncomfortable intensity, the guitar taking on an alternating stereo spread with furious tremolo picking before the track abruptly stops. The warm and inviting arpeggiated analog synthesizer that opens the following song, Arp could not be further from the melancholic opening track. All the disparate elements that made House so discordant have coalesced on this track resulting in an organic cross between modern synth-driven music and the indie rock that dominated the airwaves of the late aughts and early 2010s. Not only is the tonality and soundscape of this track both refreshing and nostalgic but the composition is more similar to free structure jazz than to conventional pop and rock music. The track briskly and delicately tiptoes forward at a changing pace without meandering or indulging in the common excess of progressive rock proclivities. This track largely sets the tone for what we experience on the rest of the EP. The album closer, 347 is a delicate arrangement of soft spun gossamer synthesizer daintily holding the indecipherable vocals being supported by the relatively rough and forward percussion and guitar. The song has more in common with the chillwave of the early 2010s than the indie rock influences that are more present on songs like Listen. While Listen is still characterized by the same synth style as 347, the ethos of alternative rock artists that gained a spot in the limelight in the past decade.